Partial spin-off transactions occur when a corporation distributes shares in a subsidiary to the public while retaining partial ownership. After a subsidiary becomes publicly traded, it is possible to determine the market value of the parent company’s investment in the subsidiary. By subtracting the subsidiary’s per-share value from the parent company’s per-share value, we will be able to isolate the implied value of the parent company’s core businesses— known as the "stub". The stub’s trading value can be at times less than its intrinsic value because the true business value of the stub becomes obscured. We try to identify stub situations where the value is significantly in excess of its current implied value. It is possible to synthetically create a stub investment by purchasing the parent company’s stock and shorting its underlying subsidiaries (the carve-out). This methodology allows investors to capture the unrealized value of the stub, while simultaneously hedging market risk. Contact us for research request. Independent Research Provider servicing the Professional and Institutional Investor. 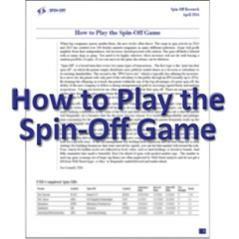 Contact us to receive the article, "How to Play the Spin-Off Game"